Maud van Souest, PhD student at Loughborough University studying the effects of dust deposition on soil development reports from the field. And we are back! Halfway through the third and last field visit of the project’s first year. The group is a bit bigger this time with seven people focused on different parts of the project. Keechy Akkerman, Clay Prater, Adam Heathcote, Tom Mockford and Rebecca McKenzie set foot on the Greenlandic soil for the first time. John Anderson is, of course, the veteran of the group (it’s his 22nd field season in Greenland) and Maud van Soest is well on her way. Today, our main task of was to move all the scientific, and less scientific equipment, that is stored here at KISS to another building (also known as moving all of John’s junk, according to Adam). The weather was supposed to be very bad, but I think that we could all use a little break of from the long days in the field. It is, however, impressive that we were able to take a break relatively early in the week. We have only one lake left to sample, most of the dust traps are reset and many kilos of soils have been collected. Clay is doing a good job in the lab trying to work out the enzyme experiment and processing the water samples that come back from the field. One of the biggest problems that we encountered is a bacterial reaction in the dust traps that makes the filtering of the sediments very difficult. A different kind of dust traps (BSNE) is installed to measure the vertical dust flux to be compared with the horizontal deposition. This will allow us to distinguish local reworking from actual dust storms. Last but not least, Tom has worked on installing DustTraks that will be deployed in April next year that measure dust concentration in the air. Keechy has been taking multiple sediment cores, rock scrapings and aquatic plants for her PhD project in order to get a grip on the spatial variability of primary productivity within the lake. Our visitor Adam was so kind to sit in the boat for at least an hour without a break to make a high resolution bathymetry using a GPS coupled to a SONAR. The last lake we visited, SS1590, was especially interesting in this respect with a complex bathymetry and large lake-level variability, which was observable from the retreated shore line and could be traced back in the long sediment core that Keechy analysed before the fieldwork started. This field visit is the most important for the soil part of Maud’s PhD, as the active layer of the soils around Kangerlussuaq are only defrosted for a very brief time, and this is the sampling window!. She has been describing the variety of the soils in the 4 lake catchments with dust traps and on the ridge in order to make some soil maps of these areas. She will analyse some of the profiles in more detail in the laboratory over winter. One more week to go in which we will finish sampling, doing our analysis in the lab and leave everything ready to go for the next field visit in April 2018! The Dusty team returned to Greenland in June, once the ice on the lakes had melted. What a difference 6 weeks makes. This is a beautiful time of year in Kangerlussuaq, with clear blue skies and warm sun, which made for some stunning hikes out to the sites among the flowers which were in bloom. Here is a video of the view across lake SS17b where we were transporting equipment across towards the next site. 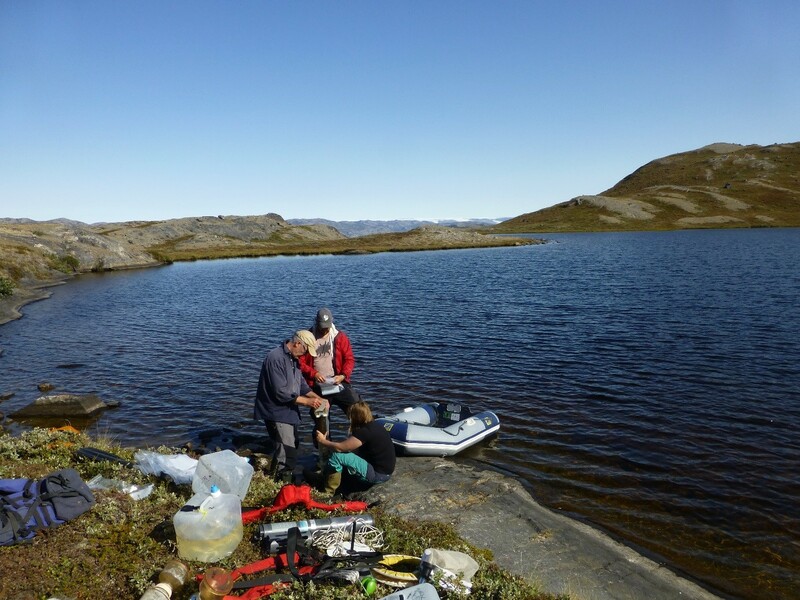 The main aims of this trip were to sample waters from a number of lakes across a transect of dust deposition leading away from the ice sheet to monitor the associated patterns of water chemistry and enzyme activity. Chris also set sediment traps to capture particulates as they settle in the lakes. We found an especially nice surprise at a new site elegantly named SS17c which had stunning views down the outwash plain, and from which we could see the wind blowing dust up onto the surrounding higher land. For this trip we had to set up the chemistry lab once more, for analysis of a range of macronutrients and for the enzyme assays. Some long lab days lay ahead, on top of the fieldwork. We also set up a leaching experiment to determine the release rates of nutrients and other elements from the dust. A dusty job weighing out the aliquots to spike the experiment with! Maud was also in charge of emptying the dust traps which were set on the April trip which will be used to monitor dust deposition. Meanwhile, back on the lake, we were sampling the benthos which grow on the bottom of the lake, using core samplers to capture the massive variability in habitats on the bottom of the lakes. Here are some Nostoc spp, a cyanobacteria which grows in very large balls on the bottom of the lake, together with charophytes. Added to this, we also using ‘Dusty Cam’ to explore the bottom habitats in the lakes. 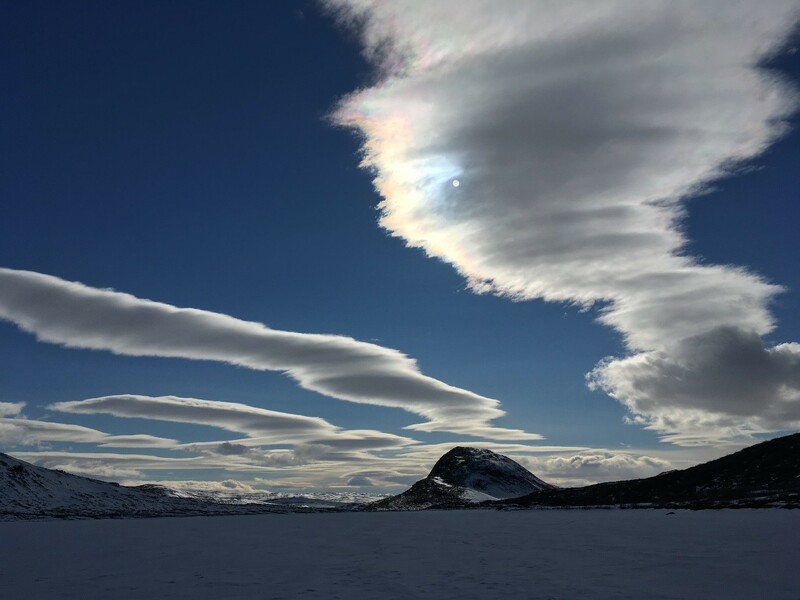 The main aim of the field sampling in April was to put up a series of ‘frisbee’ traps to collect dust in the lake catchments across the Kangerlussuaq area from the ice sheet to the mid-fjord area. This required hiking to most sites and occasionally wading through knee deep snowdrifts, given the unusual amounts of snow this year. Great effort by the dust team Maud, Matt, Jo and John for struggling through all of this. The frisbees are now installed doing their thing and will be joined by a two continuous monitoring dust track stations to be put up in the summer. Meanwhile, we also collected snow samples from the lake surfaces to look at the dust which had collected there over the winter. This was a bit of an unknown, because we did not know how ‘dirty’ the snow would be. So the first samplings involved digging large snow pits and backpacking the snow from the lakes. Again, not easy in deep snow. We also collected lake water samples by boring through the lake ice. Back at the lab, the snow was melted and filtered, revealing much higher dust quantities that we expected, and meaning that it was probably not necessary to collect so much snow. A useful pilot study. The rest of the time was spent analysing the chemistry of the snow and lake waters, and packing up samples for analysis back in the UK. It has been a week ago already since I made my first steps on the Greenlandic soil. John Anderson, Joanna Bullard, Matthew Baddock and I took the plane from Copenhagen to Kangerlussuaq on the 20th of April. We have had some magnificent views over the icecap during the flight. One of the first things that John noticed was however that there was way more snow than he expected for this time of the year. That might have cause some problems with the accessibility of the sampling sites. 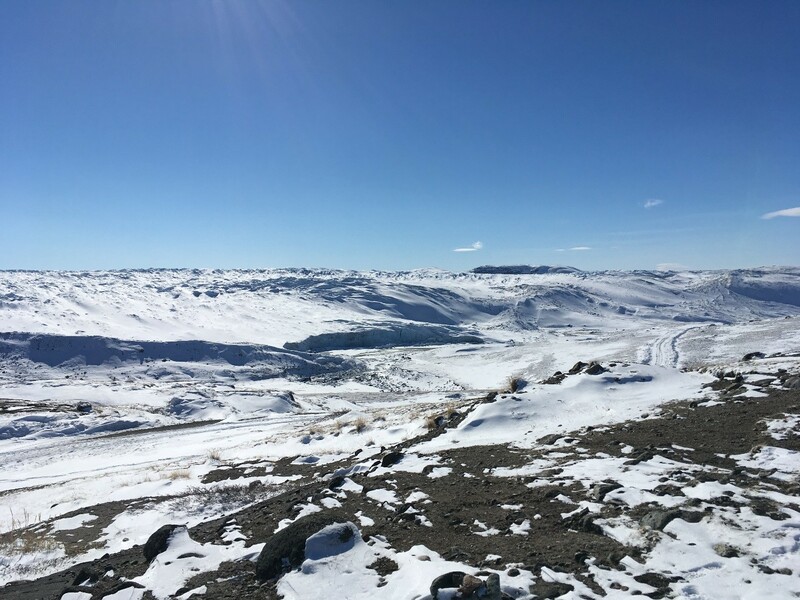 But the sun was working hard and we were about to discover in the following days that it is very normal to wake up and go to bed in a completely different landscape, as sublimation and melting were alternated with periods of fresh snow. Kangerlussuaq is the main airport of Greenland and not much more than that. The airport is one of the American settlements since the WWII and the small population of about 500 people is almost entirely reliant on the airport and tourist industry. 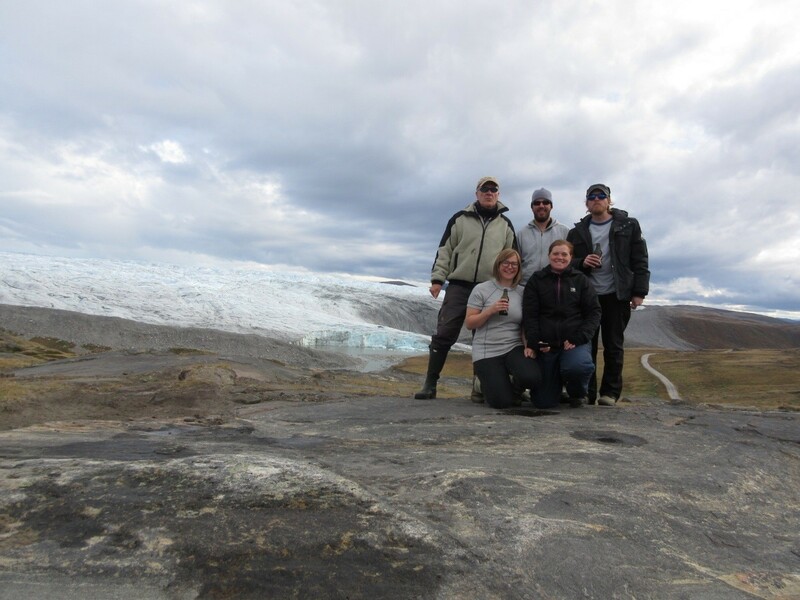 Many scientists stay a few days in Kangerlussuaq to finish the preparations for their fieldwork on the ice or in other remote areas and another few days before they go back home. We are based at KISS (Kangerlussuaq International Science Support) for the full two weeks of this first trip and occupied one of the kitchens and half of the lab space. Especially after we unpacked the pallets and spent some hours in John’s store room (Aladdin’s cave) to install and organise all the equipment. Ready for the days ahead in the field…. It’s been a busy week since the Dusty project start date on 1 April 2017 (OK perhaps not the best choice of start date…). We’ve received two ‘Dust trak’ automated monitoring stations which will be used for continuous measurements of dusts along with a weather station. This kit requires some serious battery power to operate in the cold conditions in Greenland. We also have 30 Hall deposition traps and Fryear dust traps which will be deployed at each lake site to look at local deposition patterns closer to lake sites to be studied in more detail. Added to that are the chemicals we need for analysis and many other smaller pieces of kit that we need for sampling dust and lakes, and you get a massive 8 pallets worth of equipment. Fortunately, Rebecca McKenzie (pictured left, technician at Loughborough who will be joining the field team in August) and Maud Van Souest (right, PhD student investigating dust in Greenland) were on hand to help with the packing and see off the shipment to Kangerlussuaq, ready for the fieldwork in a few weeks’ time. A new £700k NERC-funded project due to start in April 2017 will to assess how glacially-derived dust is changing the ecology of Arctic lakes. The project investigators are from Loughborough University (John Anderson and Jo Bullard), British Geological Survey (Michael Watts) and University of Nottingham (Suzanne McGowan). More information on the project can be found under the Dusty tab. 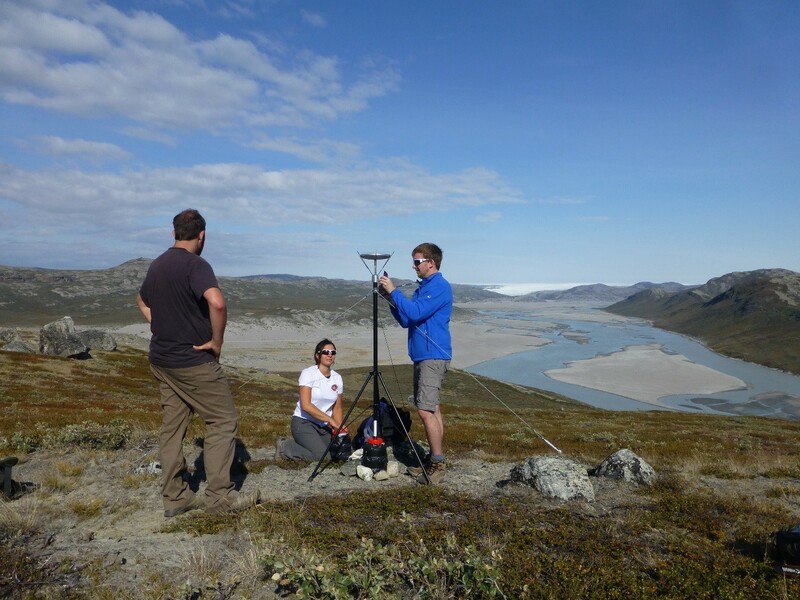 A new synthesis of the Kangerlussuaq landscape arising from a KAIRN workshop was recently published. The paper focuses on understanding how biogeochemical linkages will change with future warming.